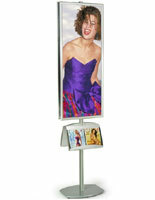 Snap Frames : An 8 ft. tall poster frame stand is sure to catch the attention of passersby! 8 FEET TALL SINGLE SIDED DISPLAY GETS ATTENTION! This poster frame stand, sign holder, is a powerful alternative to traditional floor standing graphic displays! This poster frame stand is 94" high, eye-catching and skillfully designed for maximum versatility. The snap open frame fits large 24"w x 36"h sign graphics and is effortless to swap graphics. The 2-1/4" deep acrylic literature pockets comfortably fit standard 8 ½"w x 11"h print materials. The snap holder and brochure holders are height adjustable anywhere on the poster frame stand pole. Made of durable aluminum, this floor display has a stable, wide, 18" base. 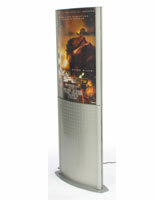 The poster stand fits best in large indoor areas to draw attention. It is best suited for high traffic areas like convention halls, theater lobbies and office building entry areas. 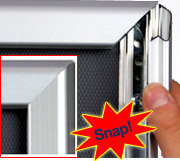 The snap open poster frame is very easy to use. Open all four edges and position the sign media beneath the clear plastic lens. The clear lenses protect the sign and are non-reflective. The acrylic literature holders have 9-1/4"w x 2-1/4"d x 8-1/4"h pockets. The snap frame and acrylic holders attach easily to the display stand pole with connector panels and screws. Heights are adjusted with the connector panel screws. This poster stand ships unassembled and assembles quickly and easily with the provided instructions.. Note: When the poster frame and acrylic pockets are at their highest adjustment, the height of the bottom acrylic pocket is 24" above the floor.